Finding things to draw can be such a time consuming task so today I'm showing subjects that I find enjoyable when I'm stuck in a nothingness place. As a bonus, they are very easy images and just might spark more creative thinking within you. Your first attempt at any subject doesn't have to be perfect, it really doesn't matter, so long as you enjoy it. Resolve to forget about being good and take the pressure off yourself because there is plenty of time for progress. Practice is a word that deters a lot of beginner artists but every time you attempt a drawing, you are actually practicing. You see, practice doesn't have to be boring or time consuming. 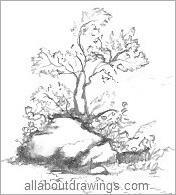 Just draw anything and everything and that takes care of the overwhelming thought of practicing. While searching for things to draw, a subject must appeal to you to ensure you have a good chance of creating a successful image. If you think your artwork looks good, that's excellent, keep going! This is a great warm-up exercise. Grass is so wonderfully simple and it gets your hand in the right groove with all those lovely, curving strokes. Now throw in a bird or two and you have completed a pretty image in your sketchbook. My next favorite is another snippet from outdoors. I enjoy the imperfections here because it allows the imagination to go in different directions. I like illustrating grass so here is a little example that takes only a minute. By the way, all of these illustrations make terrific thumbnails. You can create a boat in a matter of seconds once you discover how to translate something into simple lines. If you copied any of these images, you just completed a valuable practice session! 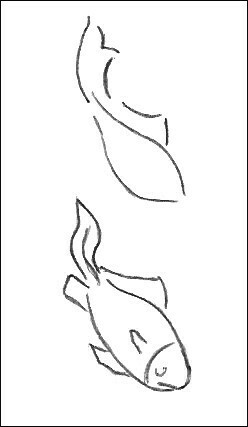 You can find several things to draw just by looking around you. This paint tin looked do-able to me and I am happy with the result. Images like this take minutes, if not seconds, to complete and they look great all jumbled together in a sketchbook. Wherever you go outdoors, you will always find things to draw. Little landscape snippets give you the confidence to tackle larger landscapes. In this sketch on the right, I spent a bit of time trying to get the rock to look authentic. It ended up being a disaster but somehow it was miraculously saved when I started to erase the harsh outline around the edges and it smudged, giving me the perfect outcome! Thank goodness I worked gently with the eraser or it would have been a lost cause. Now that drawing is a very important part of my life, I notice that I look at every object more intently. I study everything and I ask myself if I can draw it. I usually answer myself by trying it out! Just take a moment to observe before you start to sketch something and know this is a good habit for all beginners to cultivate. I experience delight whenever I complete a successful image and that reward outweighs any failures along the way. You learn so much as you go along and that's the benefit of being an active artist. Eventually you arrive at a place that is completely you - I hope to see you there!